Behind the scenes at the Nationals presidents race (Video) | Let Teddy Win! No offense to this P.A. 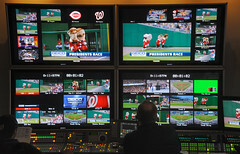 announcer – he’s merely doing his job, and in the style the Nationals want – but the “sound” of gameday on South Capitol St. is akin to that of a minor league ballpark! Pure buffoonery! Stan’s fingerprints are all over this mess too. Such a shame.